Star Fox 64 is the third game in the Star Fox franchise, and it’s widely considered one of the best games ever made and a gold standard for rail shooters. It builds off the success of the landmark first game for the SNES, recycles much of the coding from the then-canned Star Fox 2, and reboots the story to one more knowingly campy. 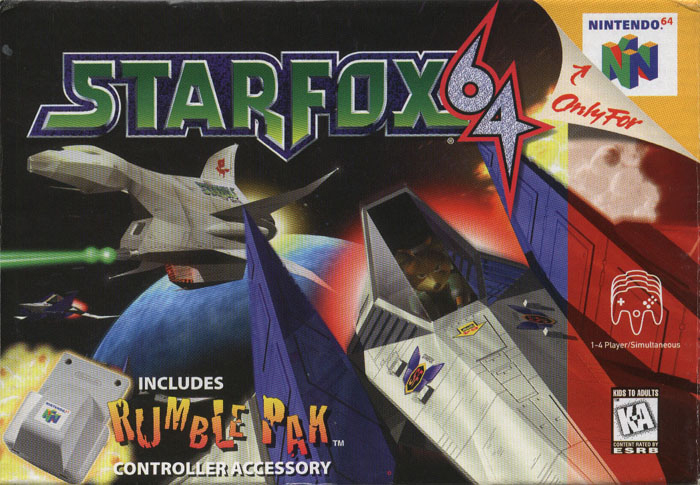 The game takes advantage of everything the Nintendo 64 could do with improved graphical quality and buttery smooth controls, plus the game was one of the first to utilize controller rumble with the included Rumble Pack. It also boasts full voice acting that, despite its silliness, holds up remarkably well and sounds shockingly natural for a time when voice acting was done by the programmers on their lunch break. The result is one of the most celebrated games on the Nintendo 64, one of the best old games to still play today, and for many the last great Star Fox game. Welcome to the Lylat System: a solar system populated by hominid animals and dozens of planets with only one ecosystem. There, evil scientist and giant disembodied ape head Andross is exiled to the distant, hellhole planet Venom. Years pass before suspicious activity is noticed on Venom; General Pepper sends the intrepid mercenary group Star Fox, led by the smooth and honorable James McCloud with screaming Texas uncle Peppy Hare and gross living trashpile Pigma Dengar to investigate. Pigma betrays Star Fox, leaving James to die and Peppy to barely escape. Peppy returns home to tell James’ son Fox of what happened, and Fox files it away for protagonist motivation to last him a lifetime. Years later, Andross has built up an army and sent them out from Venom to invade the Lylat System and claim it for his own. A new Star Fox team led by James’ equally honorable but nerdier son Fox McCloud with Peppy, genius engineer and bullet magnet Slippy Toad, and lovable smugfuck Falco Lombardi, answer the call to stop Andross and save the Lylat System. I will be playing through the Easy, Medium, and Hard routes individually without much crossover, though I will show alternate routes and level changes as asides. Each route will take 2-3 videos and each video will show 2-3 levels. I’ll also be getting every medal, and at the end of the LP I’ll briefly show off Expert Mode. Updates on Sundays and Thursdays. Joining me is Mugiwara Yoshi and JigglyJacob, both of whom have also played through the game and love it. Yoshi and I are also trading off on a series of Star Fox Let’s Plays, and Yoshi will next do Star Fox Adventures after SF64 is complete in May. This LP was originally shown to my Patreon patrons first in its entirety from March 10 through April 4 before it started going public. I’ve never actually played Star Fox 64, but I constantly hear about how great it is. I see that you say you’ll briefly show off Expert Mode. Are the differences from the other routes not substantial enough to get a full run-through, or is it a separate mode that is rather short? It’s not different enough for its own playthrough. It’s mostly just more enemies and a more fragile ship. While I’m sure you’ll cover the coolest part of Expert mode, do you show the reward for obtaining all the medals? Don’t let Slippy handle this. Easy Route concludes… not that easily. Medium route ends with… mostly Easy route parts this time. But we get to blow up a train and examine my odd childhood brain beforehand!